The University Book Shop short story series brings you three stories in which local writers relocate famous fictional characters to Dunedin, and send them on twisted adventures. Today, David Loughrey finds Frodo Baggins in straitened circumstances in a Dunedin boarding house, desperate to return to Hobbiton. Frodo Baggins awoke, his head clogged with anxious dreams. Through his groggy mind ran elves and dwarfs, there was sword play and fear and darker forces in the shadows, there was comradeship and shadowy magic. But as the phantasms of slumber slowly drifted from his consciousness he was left with a sense of unreality; the dreams and memories of the events that had shaped the now middle-aged hobbit seemed somehow disconnected from reality. Frodo Baggins sat up in his single bed, his legs hurting and a bad taste in his mouth. He stared through the mould and condensation on the small window of his room at the sharp light reflecting from the Otago Harbour, at the railway lines and the stacked containers nearby. He rubbed his eyes and thought of Hobbiton. The light there, he remembered, was softer, the grass more lush, and while the hills of the peninsula were domed and smooth like his home, they had a different feel. Frodo vaguely remembered the ample fecundity of what had been his small part of the shire, its lush pastures, the circular green door of his home, the fussy garden, the foxglove fronds, and the long summer days. He remembered it, but the details now seemed unreal. He tried to think of the various parts of his former home, where he cooked, or read or did any of the myriad things he used to do in better times, but all he could bring to mind was the green front door and the garden, like a facade of memory with nothing behind. He had come to Dunedin. He reached under his bed to find the shoes he now had to wear on frosty mornings. They were cheap grey sports shoes already ripping away at the sole, the only ones he could afford that were big enough to cover his hairy feet, so big they were that school children pointed and laughed at him in the street, calling him a clown. Sometimes he tried to ignore the children, sometimes he swore at them, and sometimes to his shame he tried to catch and beat them in his frustration and rage, but he was too slow. Big as they were, the shoes were still too tight, and when walking he had developed a sort of shuffle, the only way to stop them digging in and crushing his toes together. He was different here, an outsider. More awake now and beginning to think of the day ahead, Frodo felt the familiar fingers of anxiety begin to clutch at his chest and form a hard fist. And as on other mornings, his thoughts turned obsessively to the shire, to the grand quest to rid the world of the ring. He thought of the epic journey to Mordor, the dogged bravery of his friend Samwise Gamgee, the liberation of the shire once he returned and his journey to the Grey Havens. The tiny upstairs room of the boarding house that was all he could afford to rent felt like a prison. It was not long before 9am. Frodo looked again out the window at this foreign place, and realised he had to get back home. He grabbed the pathetic few coins he had left for the week, and from inside the cover of a large, three-volume set of books that sat on a small table with a broken drawer by his bed, he took a folded, well-worn pamphlet he briefly held to his chest, then secreted in an inside pocket of his vest. The act of leaving the house was difficult and shameful. The resident in the room on the floor below was a brute. His hair was closely cropped; he had cruel blue eyes. He boasted of being just out of prison, he mocked Frodo and threatened him, and when in his cups he was unpredictable and intimidating, gleefully humiliating the hobbit for his size and his strange ways. 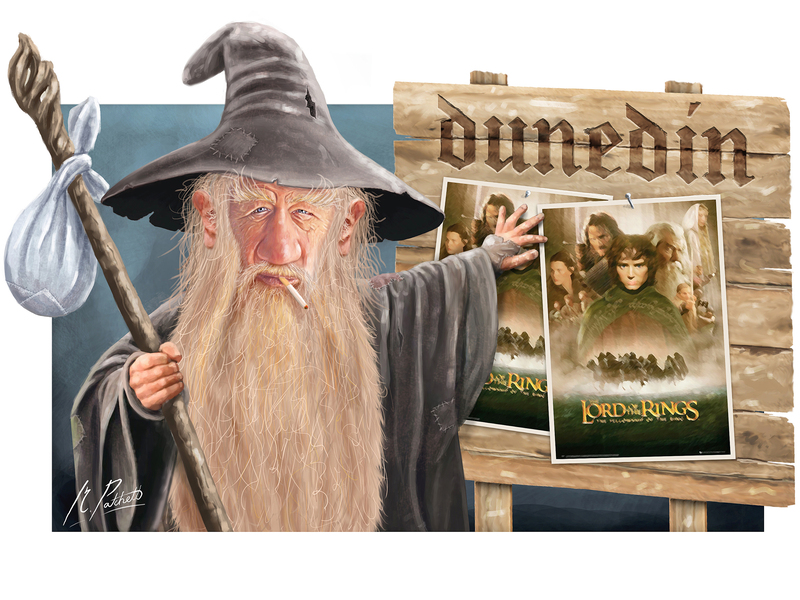 He ridiculed his stories of Middle-earth, made out they were the fantasies of a failed drunk. At times he was violent, leading to events Frodo desperately tried to usher from his mind. Frodo's heroism in times of danger faded in the face of such an everyday, domestic threat, and as he did most days, he crept in fear down the stairs, not breathing until he quietly opened the door latch and stepped into the dirty street, sick in the knowledge the whole process would have to be repeated when he returned. Outside there were still straggling, babbling groups of school children lurching to school, and Frodo took a side street to escape their cruelty, shuffling painfully into town. He had no particular destination. Today he did not want to escape into the bottle, and the night before had promised himself he would not, at least just for one day. For the last few days he had not taken the pills he had been given; they made him restless, made his mouth dry and his stomach hurt. His mind, as always, and despite his weak resistance, returned to the empty space the ring had filled. The words inscribed upon it began to repeat themselves in his mind: One ring to rule them all, one ring to find them, one ring to bring them all and in the darkness bind them, one ring to rule them all, one ring to find them. The mantra cheered Frodo as he trudged along the footpath and on to a soggy park. The sky seemed brighter and the possibilities more numerous; there began to be a sense of purpose in his walk. Perhaps, if he had the help of others, maybe he could find his way home. Frodo stopped near a large memorial to a forgotten war, rubbed his hands together, and quietly repeated his mantra, stepping from one painful foot to the other as he did so. He closed his eyes for a moment, then upon opening them, saw to his surprise and joy a familiar figure on the other side of the park. The broad brimmed peaked hat was unmistakable, and as Frodo crossed the wet grass and got closer, he saw the familiar aged face under great snowy brows, the eyes set like coals that could suddenly burst aflame. The wizard Gandalf was sitting on a park bench, his long legs thrust out in front of him, picking pieces of tobacco from a plastic zip-lock bag and laying them exactingly on a cigarette paper as he rolled himself a smoke. He saw Frodo as he approached, and smiled. Frodo noticed his teeth were yellow and his moustache stained with nicotine. Gandalf was still tall, but the wily strength and majestic bearing he once had seemed diminished. It was not quite as he remembered his old friend, but the relief of being in the presence of such a companion overwhelmed and excited him to an almost painful degree. Frodo began to speak, and after so long silent, unhappy and alone, his words unleashed themselves in a torrent, flowing from his lips, unstoppable as every pent up thought took form and found expression. He told Gandalf of his struggles, of his countless minor humiliations, his poverty of life and being, and the ignorant brute who ruled his boarding house and made his life loathsome. He told him of his dreams for going home. Gandalf was silent; he smoked his cigarette and stared into the distance. Frodo recognised in that silence the wisdom of his old friend, he saw in his deeply lined face the knowledge of years. Here was a man he could trust to help him. From his pocket Frodo pulled the well-worn pamphlet that had become warm against his chest, and he opened it on the park bench, flattening the folds with his fingers. It showed a round, green door. Frodo held it up to his friend. - David Loughrey is a Dunedin reporter, columnist and short story writer.